Just Romantic Suspense: Do You Find The Outdoors Relaxing? Do You Find The Outdoors Relaxing? Congratulations to "Lauren B." and "Theresa Z. ", the winners in Katee's giveaway. Thank you to all who participated! We all have those teachers we remember, for better or worse. One of my favorites was my ninth grade English teacher. He was a little bald guy with a sly sense of humor—usually at the expense of us students. He challenged me in a big way, helping me find books that I ended up loving for my reading outside of class. But the most lasting impression came by way of our short stories segment. He started with The Lady or the Tiger, and things went darker from there. The Lottery, The Veldt, The Monkey’s Paw. And one of my personal favorites—The Most Dangerous Game. All of those creepy stories have been bouncing around in my head ever since, and never more so than when I’m plotting and drafting my romantic suspense stories. The Most Dangerous Game, in particular was one jumping off point for The Hunting Grounds. There’s something inherently terrifying about a hunter who’s decided that humans would make better prey than animals. 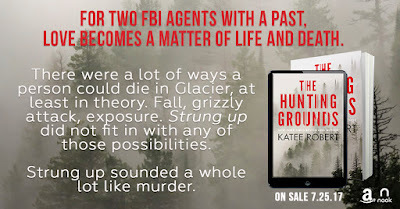 Suddenly, being human isn’t enough to keep you at the top of the food chain—because you’re being hunted by someone who’s just as smart, just as clever…and more prepared than you could ever be for a mad dash through the woods. The majority of murder mysteries have an element of this feeling in them—the story is usually a push and pull between the hero/heroine and the killer, though the role of hunter and hunted change depending on the story. 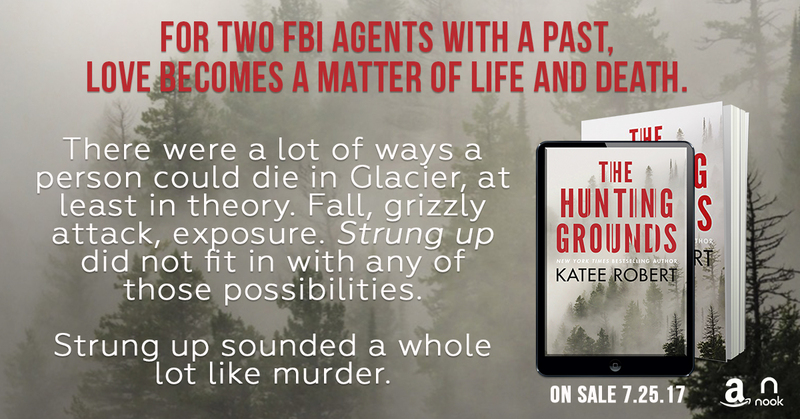 But for The Hunting Grounds, I wanted to take the story to its most literal interpretation—the killer is actually hunting and killing people in Glacier National Park. I’ve been to Glacier once or twice over the years, and it’s one of the most humbling experiences. The mountains tower over you, the beauty is breathtaking, and it feels like a layer of civility is ripped away. Out there on the trails, miles and hours away from anything resembling civilization, and you start to have an inkling about what it was like not to be at the top of the food chain. Now, Glacier is one of the safest parks out there in terms of the numbers—it doesn’t even hit top five when it comes to national park deaths—but you still spend a bit of time thinking quite vividly of all the things that could go wrong. For The Hunting Grounds, I followed that thought all the way down the rabbit hole. What’s the worst that could go wrong? Well, you could be being hunted by someone who is better equipped, better prepared, and has the element of surprise on top of all that. No way to call for help. No way to effectively defend yourself—from either killer or the elements. Several days’ hike to get to a road. And if someone does hear you scream, they’re almost certainly too far away to be able to help. Where do you fall on the outdoorsy spectrum? Do you find it relaxing? Or does is creep you out like crazy? Katee is awarding an ecopy of THE DEVIL'S DAUGHTER to two lucky readers leaving a comment or email entry. I love the great outdoors. We once camped in the redwood forest and it was phenomenal. Trees bigger than trucks. It was very humbling, but also very peaceful. I guess that's the best part, it's quiet and peaceful. But if I am reading a book about the great outdoors I want adrenaline pumping excitement. 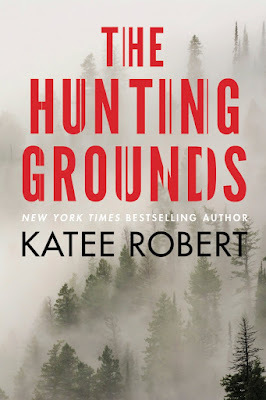 Sounds like The Hunting Grounds will be just what I want. I am an indoor person all the way. I do not do well in heat or in extreme cold. Fall is my favorite time of year to be out and about when it's not so hot but temperatures haven't dropped to the uncomfortable point yet. Thanks for the giveaway. debbiemac73 at yahoo dot com. I fall in the middle of the outdoorsy spectrum. I am more of an indoor person. I like the privacy. In my youth, I was quite the outdoors woman. I would stay at our small lakeside cabin and take off into the woods. I would climb towards the top of the neighboring mountain, just taking off into the woods and heading up. There were no trails and I rarely went the same way more than once. One winter I did a white tailed deer study tracking them and noting behaviors. I also saw tracks for bobcats and wild dogs on those hikes. Today, not so much. I am much older (50 years older) and much less mobile. My husband and I still go out and hike when we can, but not the difficult trails we used to do. We did make it to Glacier about 4 years ago. It is spectacular. We hope to go back next year and continue over the border into the Canadian part of the park. Today, we do think more about the dangers than we did in our youth. I don't know if it is because there are more dangers out there or if we are just more aware of them. Could be we just aren't young and stupid anymore. It depends what I'm doing outdoors - I love to read on benches in the park or at the beach, but the woods freak me out. Thanks Maureen and Katee. I've received my copy from Amazon.